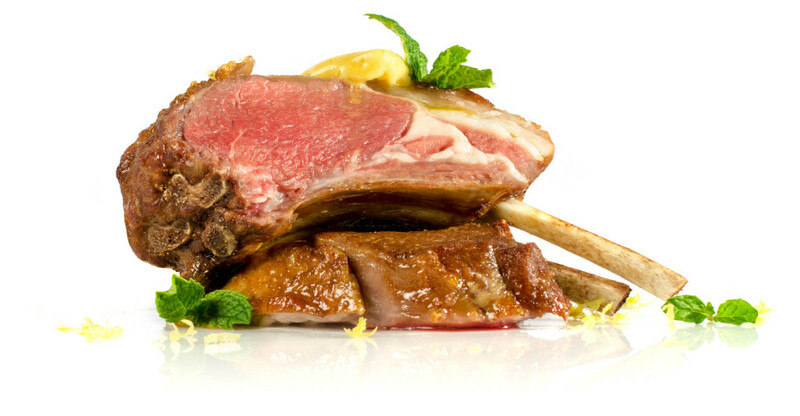 Rack of lamb is a quintessential spring recipe, and an excellent opportunity to let the Sansaire take the stress out of working with oddly-shaped cuts. In this recipe, we adopt the classic pairing of lamb and mint by infusing the flavor of fresh mint leaves into butter. To put a perfect, golden crust on the lamb, we briefly deep-fry it after it has been fully cooked sous vide. Traditional oven roasting can be a challenge for thin, bone-in cuts like rack of lamb can because their timing depends on the exact shape, size and orientation of the meat on your roasting pan. The typical workaround is to monitor a probe thermometer to measure the internal temperature of the meat. However, even if you’re paying very close attention, it’s easy to over- or under-shoot the right doneness, since the meat will continue cooking after you’ve taken it out of the oven. In this circumstance, lamb is very unforgiving – it dries out easily when overcooked by just a few degrees. That won’t be a problem for us, since we’re cooking the lamb sous vide. We’re keeping our seasoning pretty simple to let the natural flavor of the lamb shine through, but brushing a little soy sauce on the outside of the meat also provides extra sugars that help form a delicious crust when we deep fry the lamb pieces. While the meat is cooking, we’ll also create our mint butter, a variation on the traditional mint jelly condiment often served with lamb. The flavor of the mint butter is subtle, as most of the volatile compounds in the mint are not soluble (they don’t dissolve) in fat. However, the infused butter contains many of the oils released from the mint leaves, providing the essential flavor of the plant. Note that the same infusion process works for other herbs or spices as well, should you wish to mix things up. Preheat your water bath to 54°C / 129°F. Brush all sides of the meat with soy sauce to season. Place the rack of lamb in a vacuum bag* and seal. Cook for 1 hour minimum, up to 6 hours. Prepare a narrow pot with tall sides for deep frying. Add enough oil to fill the pot about 2” deep and heat to 190°C / 375°F degrees on your stovetop. Remove the rack of lamb from the bag and transfer to a carving board. Pat the meat thoroughly dry with paper towels. With the bone-side-up, cut the rack of lamb into 2-rib segments. Deep fry the lamb segments, working a few at a time, until a golden crust forms on the outside, about 60 seconds. Garnish with lemon zest, flaky sea salt, and a pat of mint butter. Note: you can cook the mint butter in the same water bath as the lamb, above. Combine mint leaves, sugar, and butter in a bag, removing as much air as possible. Cook for 30 minutes, or up to 1 hour for a stronger infusion. Pour the butter mixture through a fine mesh strainer, reserving the strained butter. You may discard the mint leaves. Refrigerate the butter to allow it to harden. Alternately, place the liquid butter in a metal container placed within an ice bath and stir the butter until hardened. Reserve butter for use below. Can be made up to 30 days ahead of time and stored covered in the refrigerator, or up to 90 days in the freezer.